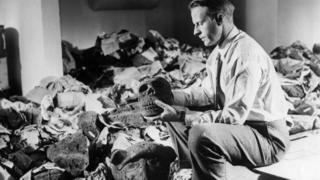 Norway has agreed to return thousands of artefacts taken from Chile's Easter Island by renowned Norwegian explorer Thor Heyerdahl in 1956. The agreement was signed by his son on behalf of Oslo's Kon-Tiki museum and Chile's culture ministry in Santiago. Kon-Tiki2: Why would you cross the Pacific on a wooden raft? Who should own indigenous art? Heyerdahl conducted the first co-ordinated excavations on the remote island whose many carved heads stand guard over the Pacific. It was signed in Chile's National Library in Santiago. Heyerdahl's son, Thor Heyerdahl Jr, says "the repatriation is a fulfilment of my father's promise to the Rapa Nui authorities that the objects would be returned after they had been analysed and published", he is quoted as saying by the AFP news agency. Kon-Tiki museum director Martin Biehl said "our common interest is that the objects are returned and, above all, delivered to a well-equipped museum". The whole process "will take time", he said, without giving any further details. After the signing ceremony, Chilean Culture Minister Consuelo Valdes stressed that "as a ministry we have the mission to respond to the just demand of the Rapa Nui people to recover their cultural heritage". Chile is also demanding that London's British Museum return the figure of Hoa Hakananai'a, an imposing basalt statue from Easter Island. In November, a delegation from Rapa Nui met the museum's directorate to discuss the request. Chile's Minister for National Property, Felipe Ward, took part in the talks, which he said were "the first of many conversions we will have". The museum, which holds cultural treasures from around the world, alluded to the possibility of a loan, but made no mention of returning the artefact definitively. "The museum is one of the world's leading lenders and the trustees will always consider loan requests subject to usual conditions," a spokeswoman for the museum told AFP at the time. Such statues, known as moai, were carved by the island's indigenous Rapa Nui people to embody the spirit of a prominent ancestor, with each considered to be the person's living incarnation.